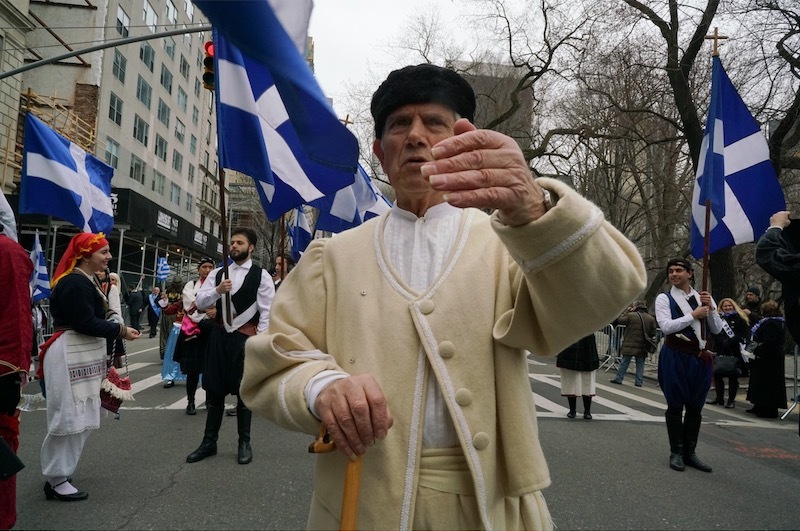 The Greek Independence Day parade celebrates not only Greek independence, but also Greek identity in both Greece and throughout the diaspora, representing the enduring nation across time and space. Throughout Greek communities across the globe, the parade performs a collective identification with the historical homeland, with the individual parades carrying their own unique styles and histories within their respective local and national contexts. Still, the main claims these parades make—whether in Athens, Melbourne, or New York City—are uniform: They assert collective identity and reenact the national narrative of cultural continuity, love for the nation, and civilizational success. The parading nation in a sea of national symbols, from flags to ethnic costumes, from signs to slogans, is on display for the whole world to see. What do spectators see at the parade, and what do they say about seeing it? How do they see it? Not only in the physical act of looking, but in the way it is perceived? Inevitably, the spectacle of the parade commands the direction of the gaze. A host of strikingly visible symbols—costumes, banners, floats, flags, crosses, the personification of historical figures and the evocation of national monuments—create a sensory overload, rendering national, ethnic, and religious affiliations hypervisible. The visual excess of the parade in motion inevitably exercises power over the spectators, unequivocally centering diaspora’s identification with the homeland nation. Ways of seeing vary, of course, as one’s visual consumption of an event depends on the particularity of an onlooker. A gaze is a function of one’s subjectivity, shaped by one’s experiences, interests in, and ideas about the world. 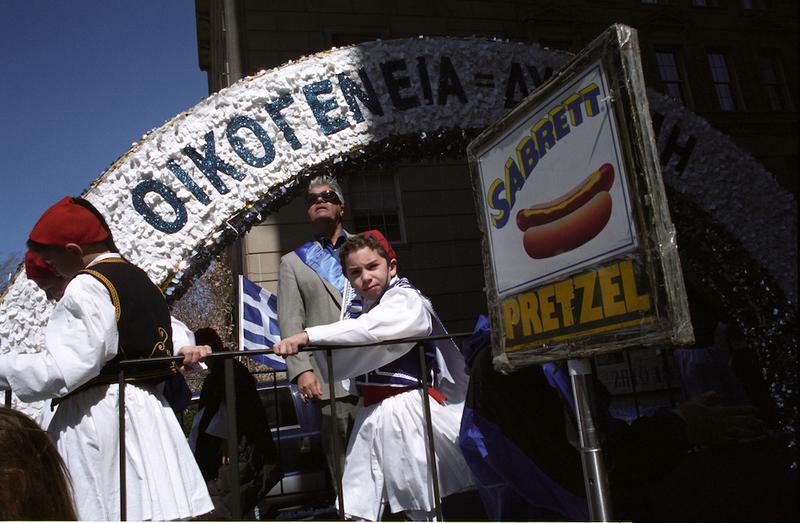 New immigrants from Greece, for instance, encounter American-style Greek Independence Day parades through the lens of their personal experience of the event’s counterpart in the homeland. In these instances, they might function as anthropologists, comparing and contrasting the two. 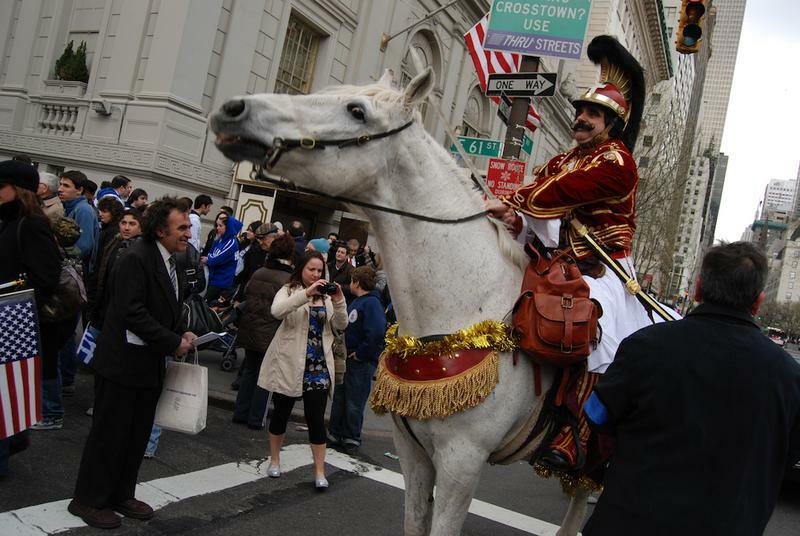 Newcomers to Greek America certainly readily recognize the parade’s key Greek symbols. But they also mark unfamiliar surroundings, signs, and sights: the urban skyline in the background, ethnically diverse spectators cheering the marchers, the mingling of national flags; English-speaking participants expressing a Greek identity; placards in English bringing the Greek homeland home in America: “Greece is everywhere, even in Ann Arbor [Michigan].” This mixing of unlikely codes may create a surrealist, dreamlike experience, as it casts the Greek American familiar into a Greek strange. In her blog entry about the Greek Independence Day parade in Detroit, Michigan, Giota Tachtara aptly brings into focus this wonderment toward an encounter with a cultural expression that feels simultaneously same and different. Her title, “ιτς ολ γκρικ του μι,” captures the simultaneous familiarity and strangeness of the event from the immigrant’s perspective. Cultural anthropologists have been drawn to the realities, rhetoric, and rhythms of the parades too. They research their histories. They take a close look into not only the parade’s visible claims, but also its seemingly invisible undercurrents. The ethnographic lens privileges the particular, refusing, therefore, to be consumed and subsumed by the official spectacle. Resisting its monopoly, it allocates due attention to the sidelines where spectators look, feel, think, comment, and even make public statements on banners.1 Ethnographers are authorized to make public what takes place at a distance from the public: a conversation on the side street commenting on the parade or a debate within the close circle of the organizers. Looking into the sidelines illuminates the parade as an event subjected to multiple ways of seeing. If the official parade constructs a dazzling, visually grandiose space, the sidelines offer a space that enables unofficial ideas: perspectives other than those dominating the central stage. In the margins of the side streets, spectators can exercise explicit and implicit pressure on the boundaries of the parade. For in these margins, the expressions of alternative identities, as well as the dissent or critique of official ideologies, are at play, sometimes readily recognized but other times not. Displays at the margin’s today may be tomorrow’s displays on the parade’s main stage. Greek American spectators are far from passive onlookers. They do publicly display their own identity claims of who may count as a Greek, and in doing so they may confront official narratives. 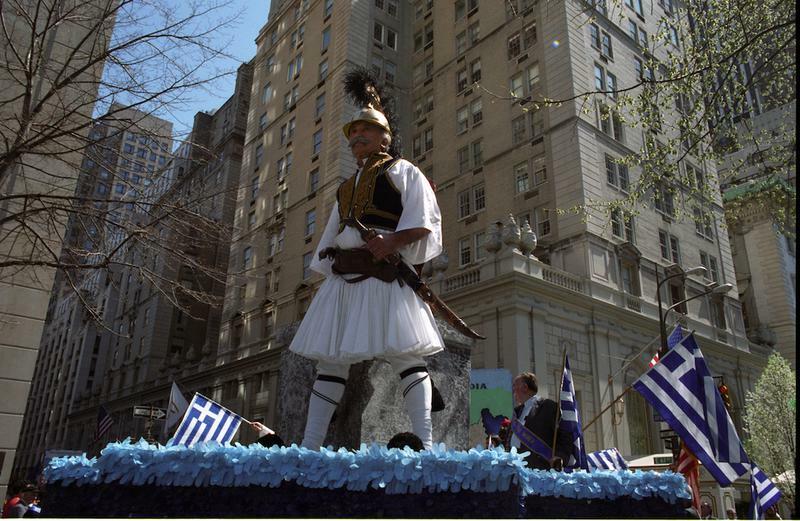 Cultural anthropologist Leonidas Vournelis has shared with me this example from the 2017 New York City parade: A family held a poster celebrating the NBA basketball star Giannis Antentokoumpo, the son of Nigerian immigrants in Greece, and now a Greek citizen, thereby foregrounding his identity as Greek.4 The Greek American community has embraced Giannis as a fellow Greek, and this adulation finds expression in the parade as a position at the margins that expands normative definitions of Greek identity beyond criteria of descent. 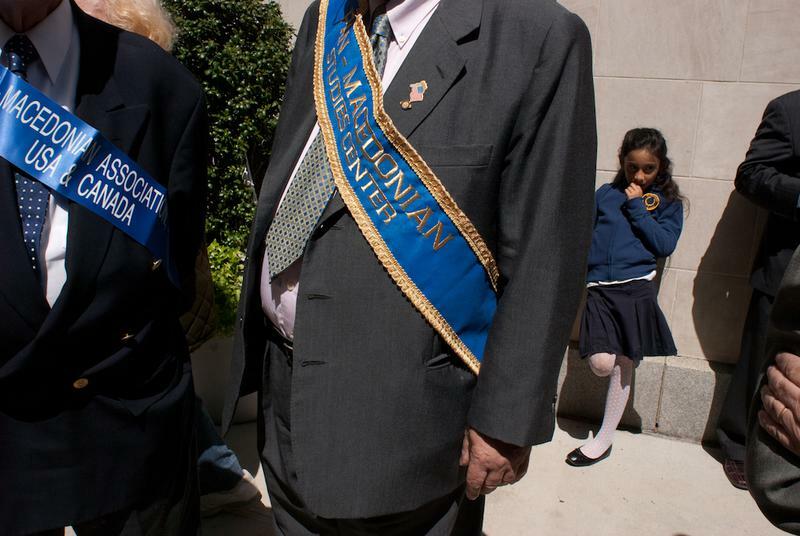 In his visual rendering of New York City’s Greek Independence Day parade (New York City's Greek Independence Day Parade: Seeing Beyond the Spectacle), photographer Dimitris Mellos also directs his camera toward the side streets. His interest is drawn to this backstage as if this somewhat ordinary, certainly not spectacular facet of the parade caries an interest one cannot afford to overlook. The lens focuses on the individual participants before the parade’s official commencement and after its conclusion. It includes spectators too. In this framing, the materiality of the symbols is inevitably present. Spectators wrap themselves in Greek flags, embodying national and ethnoreligious identity through costume. But if the main spectacle invites the seeing of individuals as a collective ethnonational subject, Mellos opens up another angle. His photography foregrounds the individuality of the human figure, inviting our gaze to meet the humanity of the participants: faces, bodies, culturally specific gestures. The camera places them at the center for us to unfailingly look. The side streets represent a space and time for social intimacy. For one, the body posture of the marchers-to-be is relaxed, unguarded. If parades require a scripted presentation of the Self, the backstage creates a juxtaposition largely absent from the event’s center stage. Still immersed in official symbols, the body drops its guard as it finds itself away from the gaze of the spectators; away from the overriding script of the parade. Informal sociability reigns. Adults and children bond. Human emotions not permitted in the parade’s official space, boredom and fatigue for instance, are freely on display. 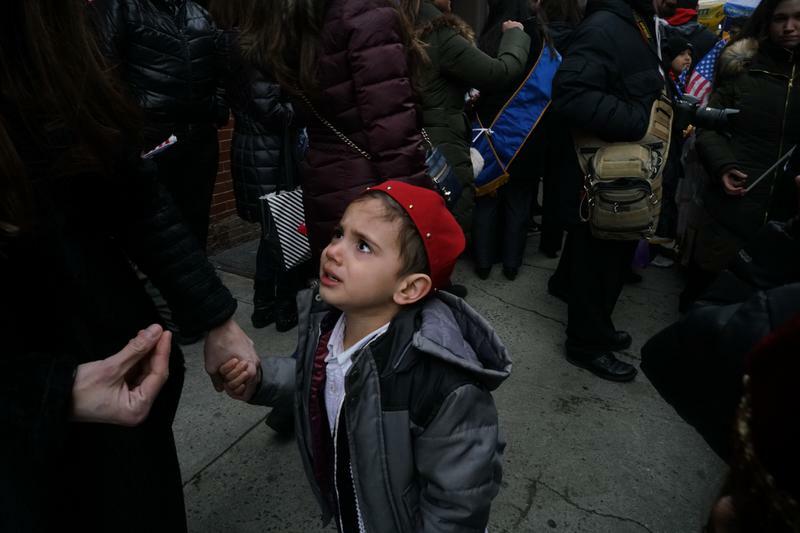 Is it that some children appear perplexed, seeking reassurance from parents? Is it that an adult scolds a child? It is hard to tell. But these backstage side streets certainly intertwine the public and the familial; the formal symbol with the informal, less-reverent, unperforming body; the social gathering with the individual. Mellos’s art is drawn to this in-between space. Mellos taps into the liminality of the backstage. His angle of seeing invites attention beyond the main ideas of the event. If the parade showcases collective togetherness, the camera points to a person’s individuality, including moments of aloneness. It is as if this focus is asking, what do we know about this or that individual beyond the surface staging of the ethnic self? If the main parade dwarfs individuality under the banners of collective identity, the backstage reframes it beyond the official rhetoric, amplifying it. The camera probes the mundane beyond the spectacle. Looking at Mellos’s images, one notices the camera’s additional interventions. The parade performs a singular ethnoreligious, Greek Orthodox, identity, turning, temporarily, New York’s cosmopolitan Fifth Avenue into a homogeneous space. The lens, however, does not allow the ethnonational element to dominate its field of vision. It “remembers” the urban context, representing it artfully through the act of juxtaposition. 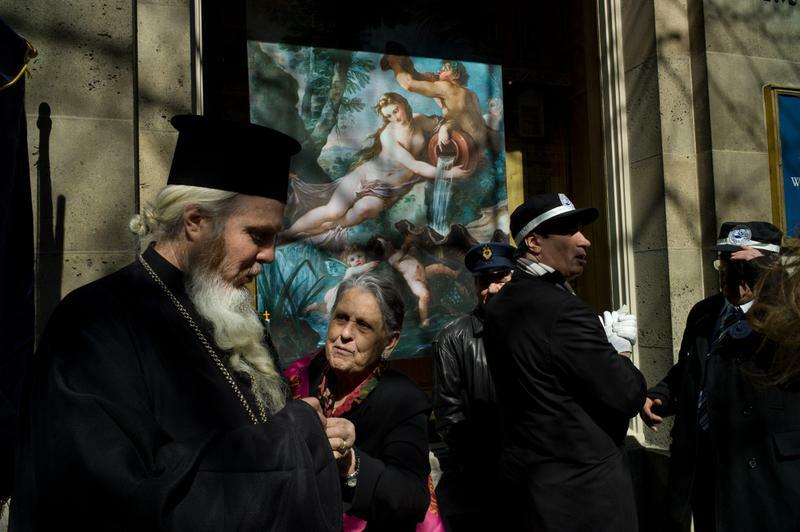 The towering figure of the Greek Orthodox priest, shown above, is captured against the painting La Source, showcased at the window of a commercial art gallery. Or a sign extolling Greek family as a source of strength is shown in relation to a commercial sign advertising a brand of pretzels. The camera directs our seeing beyond the performance of a singular identity to include the city’s cultural-scape. It is as if the recognition of the larger context of the urban surrounding encourages viewers to see New York Greeks not as isolated from New York cultures, but instead, more realistically, linked with them in dynamic cross-fertilizations. Other cross-cultural associations surface in my mind. Nicolaos Kalas, a poet and cultural critic deeply anchored in both the cultures of Manhattan and the Plaka neighborhood of Athens, looms large. And who can possibly forget the 1949 song Γιατί Γλυκό μου Sweetheart, an interlingual Greek/English gem, first recorded in New York City? The song is a contemporary hit as well, being reinterpreted variously in Greek America and Greece. “What is to be gained, or lost, by parading one’s ethnicity for public consumption?” historian Andonis Piperoglou asks, reflecting on Melbourne’s Greek Independence Day parade. Seeing the parade via the social practices taking place at the side streets feeds the imagination beyond ordinary ways of seeing. It animates untapped possibilities, the flight of the imagination to conceive the parade differently. It dares us to imagine, for instance, a reversal. What if the identity claims performed at the margins were to be placed at the parade’s center stage? In this rethinking, the Evzones, the presidential guard flown from Greece to lead the parade, would have included the adult children of immigrants, no matter their racial background. Floats would have featured signs calling the community to match its extolled ideals of civic virtues with its real social practices. Leading the cultural parade would had been a series of representations celebrating the dynamic fluidity and syncretic dimensions of Hellenism: personifications of authors, poets, scientists, and public figures who crossed Greek American boundaries, inhabited the two cultural worlds, and gave voice to this experience in ways that have been enriching our ways of seeing bicultural realities. Moving away from the rhetoric of authenticity, or questioning the very ideas of what is authentic, such an inclusion would have contributed to a more intensely colorful and certainly educationally broader parade. The parade’s margins animate the work and world of the imagination. They set the trajectory toward a bold reconfiguration of the parade—the bolder the parade, the more soaring the imagination—to include public representations using floats that more accurately link the culture on display with the multiple realities of Greek America on the ground. 1. See Leonidas Vournelis, Living the Crisis: Identities and Materialities in a Transnational Greek Setting . Diss. Southern Illinois University Carbondale, 2012. 2. Leonidas Vournelis, personal communication, March 2018. 3. For ethnic parades in Manhattan as enactments of the Irish prototype–its grammar–but also as dynamic events see Amy Malek, “Public Performances of Identity Negotiation in the Iranian Diaspora: The New York Persian Day Parade,” Comparative Studies of South Asia, Africa and the Middle East 31 no2, 2011, pp. 388–410. 4. Personal communication, March 2018. 5. The economic crisis was the reason that, in the 2018 parade, no politicians were invited from Greece. Antonis Diamataris, “Why the Parade Must Succeed.” The National Herald, April 15, 2018. 6. On “cultural intimacy” see Michael Herzfeld, Cultural Intimacy: Social Poetics in the Nation-State. Psychology Press, 1997. 7. Personal communication, March 2018. Yiorgos Anagnostou lives and works in Columbus, Ohio.